When I tried to check in, the airline staff said that I was showing up on the computer as having no ETA. they swiped my passport right in front of me and showed me what it said on the computer screen. I was denied boarding and had to buy a new ticket! They said that having the confirmation email which says that the ETA has been issued, is not enough, and that we have to wait for it to also register on the computer system, and that this can take between 5 minutes and 2 days. I have seen nowhere online where it says this (about 5 minutes to 2 days waiting time between receiving the ETA and being allowed to travel). Is it really true? Also, should be done about this computer glitch? The airline wouldn't give me a refund because they said it's my responsibility to make sure I have the visa in time (I did have it when I tried to check in though!). 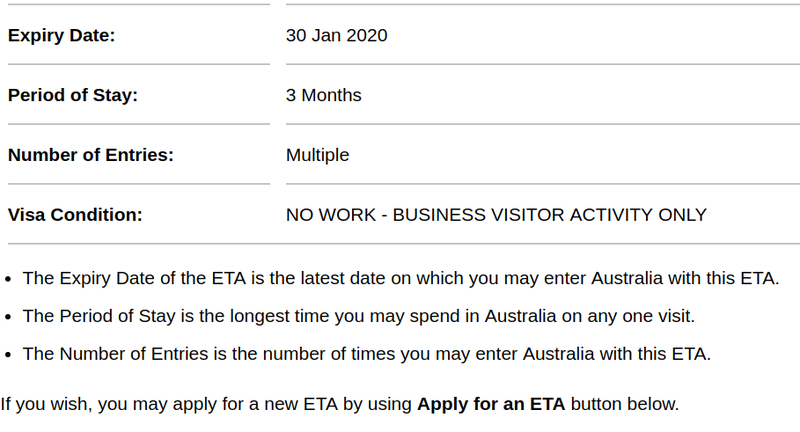 This means that ivisa.com.au was not a scam and the Australian government does have my correct passport number as having an ETA in their system. The short answer is I suspect that your ETA was not transferred to the appropriate system in time, possibly due to a system issue. The airline could have used an alternative procedure to verify your ETA, but chose to deny boarding instead. 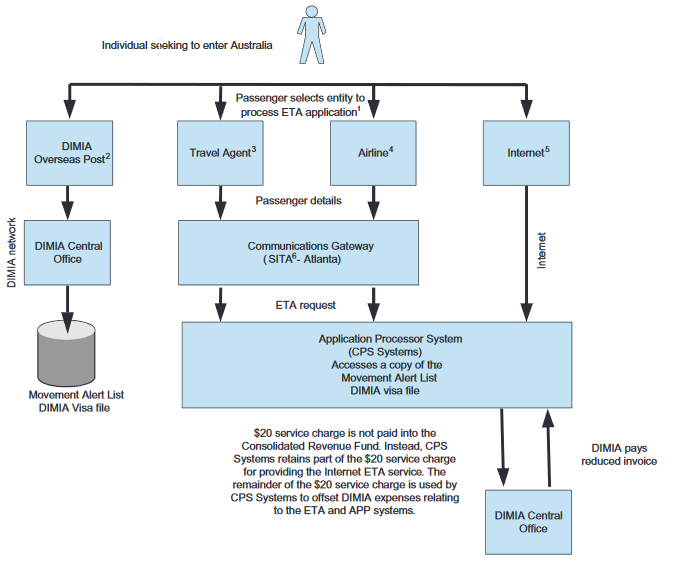 Firstly, there are two systems which passengers interact with when travelling to Australia on an ETA. They are described extensively in this Australian National Audit Office report. The ETA System is the system that manages ETAs. It is developed by CPS Systems and is hosted on the SITA network. Travel agents and airlines have access to the system through the SITA network. Members of the public can access the system through the web site (for which they pay an AUD 20 fee to SITA when applying for an ETA). 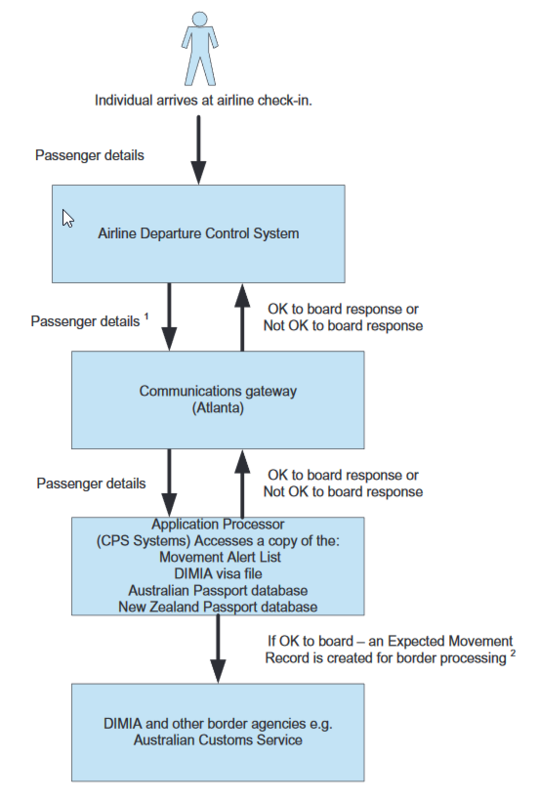 The Advance Passenger Processing (APP) system is the system that is used to check a passenger's Australian immigration status at check-in. The system, among other things, queries the visa database to see whether a passenger's passport has a visa record attached, which then determines whether the passenger can board. Check-in agents have access to this system through their departure control system. What appears to have happened is that your ETA application was processed correctly by the ETA system, but the visa record was not updated in time to be accessible by the APP system when you check in. As a result, APP returned a do not board message. Check if there is a valid visa by completing a TIETAC or TIETAQ through the ETA System. Had the check-in agent followed this procedure they probably would have found the ETA. Given the discrepancy, the check-in agent would then call the Australian Government's Border Operations Centre (BOC) to have it sorted out. The BOC can approve a government (G) override of the APP system to allow you to board. You obtained your ETA via a third party, and not via the Australian Government directly as is normally recommended. In and of itself doing this isn't a problem, and there are many parties that can obtain ETA's on your behalf, including some that are (in some sense of the word or other) scams, but also many that are not. The company mentioned in your email, "IVisa Services" from North Sydney was a valid business name, however their business registration was canceled in 2016. This could potentially be a sign of a scam, however in this case I don't necessarily believe it is. ETA's are normally processed and approved instantly, however around 10% of them will take longer to be approved, generally after they are manually processed by a human. This can take anywhere from minutes to hours (or in the worst case, days). Even then, this presumes that the company you obtained the ETA though submitted it to the Australian Government immediately, which it's possible they did not. ETA's are generally verified automatically by the airline systems. In the event that the validation fails the airline staff have a number they can contact to verify the reason for the failure and potentially receive approval to board the passenger if there has been an error. Your ETA had not been processed at the time you attempted to board the plane, but was only approved sometime afterwards. This would explain why you can see it as being valid now, but the airline couldn't. Your email confirmation does say that it's already been approved, but given that this is an email from an unofficial source we can't be certain that it's reliable. It's possible that this company will always claim that it's been approved once it's been submitted, even if it hasn't been. The airlines validation of your ETA failed for some reason (eg, computer error), and they failed to follow the manual process to confirm you had a valid ETA. Not the answer you're looking for? Browse other questions tagged air-travel australia eta or ask your own question.